Japan released the All Industries Activity m/m. The US will publish Natural Gas Storage, Crude Oil Inventories, Revised UoM Inflation Expectations, Existing Home Sales, CB Leading Index m/m, Revised UoM Consumer Sentiment, Unemployment Claims, Durable Goods Orders m/m and Core Durable Goods Orders m/m. The support rests at 112.680 with resistance at 112.980 which both lines are below the weekly pivot point at 113.220. The EMA of 10 is moving with bullish bias in the ascendant channel and it is below the EMA of 200 and the EMA of 100. The RSI is rising towards the 50 level, the Stochastic is moving in high ranges and the MACD line is above the signal line in the positive territory. The ADX is not showing any clear signals. 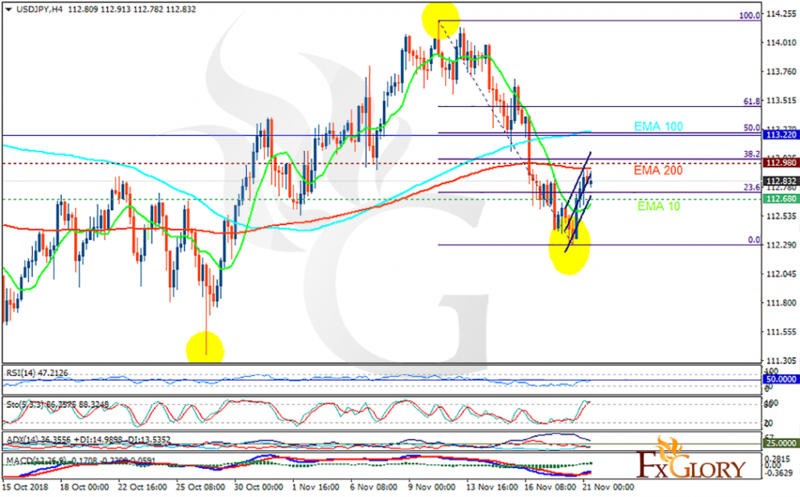 Long positions are recommended towards 61.8 level of Fibonacci at 113.4.